From sipping an umbrella-garnished cocktail in a lounge chair to clinking beer steins among friends at a rowdy pub, alcohol has a unique way of punctuating social events no matter where they unfold. At home, at a lakeside cookout, at a campsite in the woods – you name it, there’s a drink for it. On average, Americans consume 1.4 drinks per day, 9.5 drinks per week, and 494 drinks per year – but when people find themselves on the wrong side of that daily average, things can go south quickly. We’re talking broken bones, fistfights, and concussions, oh my! Getting drunk is often synonymous with getting clumsy, so we wanted to know more about the “battle scars” people have acquired after a night of boozing. Read on for 1,003 Americans’ stories of cuts, bruises, and fractures, as well as tales of birthdays, bachelor parties, and occasional tumbles – and the beverages behind the chaos. If a night of revelry is on the horizon, you are most likely to get a bruise at a house party after drinking a bunch of beer – at least, those were our respondents’ experiences. Beer, America’s favorite booze, was the culprit behind 58 percent of alcohol-related injuries (no better time to look into non-alcoholic alternatives), with vodka scooping up second place at 47 percent. 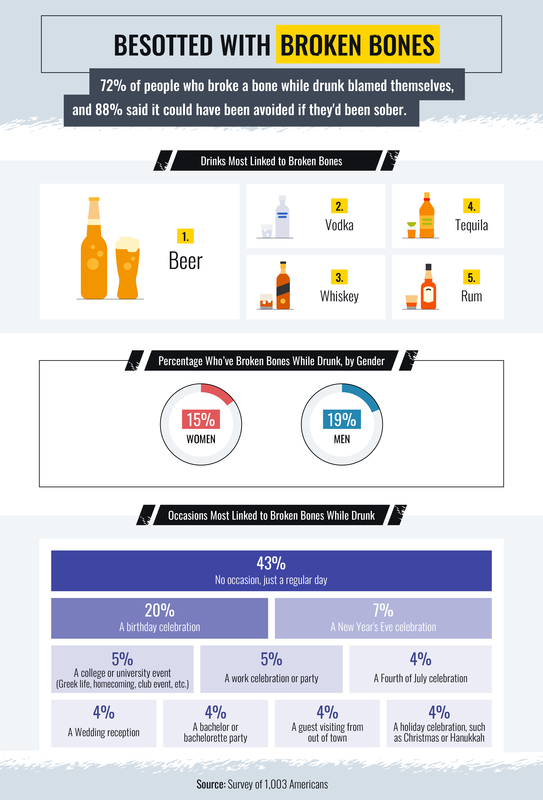 Brandy drinkers were the least likely to hurt themselves, with just 2 percent reporting an intoxicated injury. Luckily, the majority of people did not meet an irreversible fate. In fact, most reported a bruise as the extent of their injuries, which accounted for 53 percent. Cuts and scratches took second and third place respectively. The severity ramped up with broken or fractured bones in fourth place – accounting for 23 percent of intoxicated mishaps. By and large, people were sustaining these injuries in a private residence: House parties were the most likely sites for bodily harm to occur, accounting for 26 percent of alcohol-related injuries. The injured party’s home was the second-most likely scene of the crime, at 21 percent. 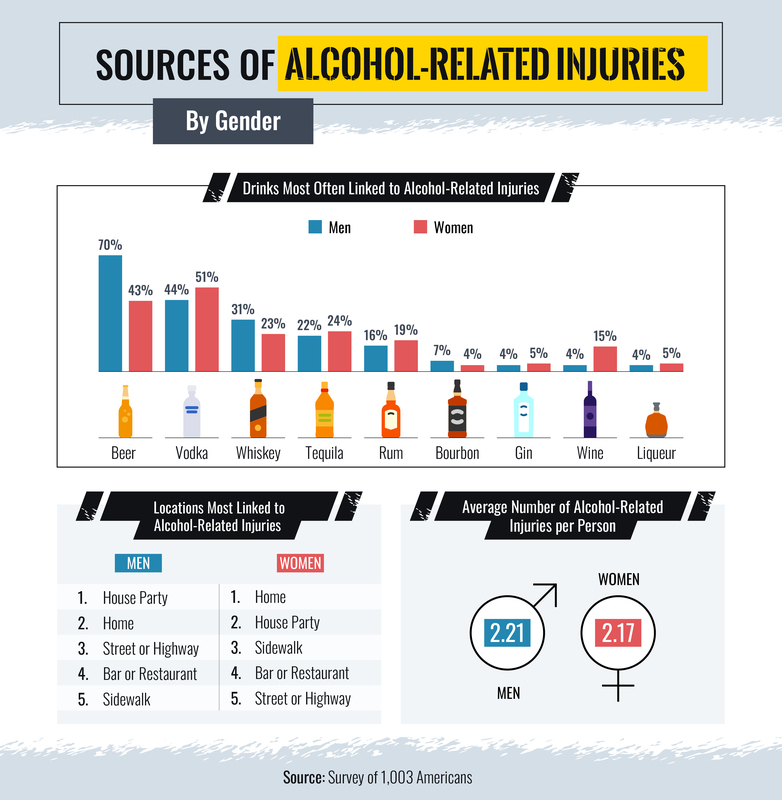 When broken down by gender, beer and vodka were still the main culprits behind people’s injuries, and the main locales were still house parties and the injured individual’s own home. However, the No. 1 slots in both categories were different across gender lines: Men were most likely to get hurt at a house party while drinking beer, while women reported the most incidents after drinking vodka in their own home. When looking at second place, the data was swapped between genders. Finally, the number of injuries incurred between men and women was almost the exact same: 2.21 and 2.17 respectively. While this may come as a surprise to some given the female gender’s more risk-averse reputation, new findings have explained that this perception isn’t quite true: It’s not that the frequency of risk-taking varies by gender, but rather the nature of the risks. While each gender’s chance of getting injured while under the influence might have bordered on identical, men reigned supreme in the broken bone category. Nineteen percent of men and 15 percent women reported fractures. The usual suspects – beer, vodka, and whiskey – were the drinks behind the majority of broken bones. But to what occasion did people owe the displeasure? For most (43 percent, to be exact), it was a regular day in the life that led to their alcohol-fueled fracture. 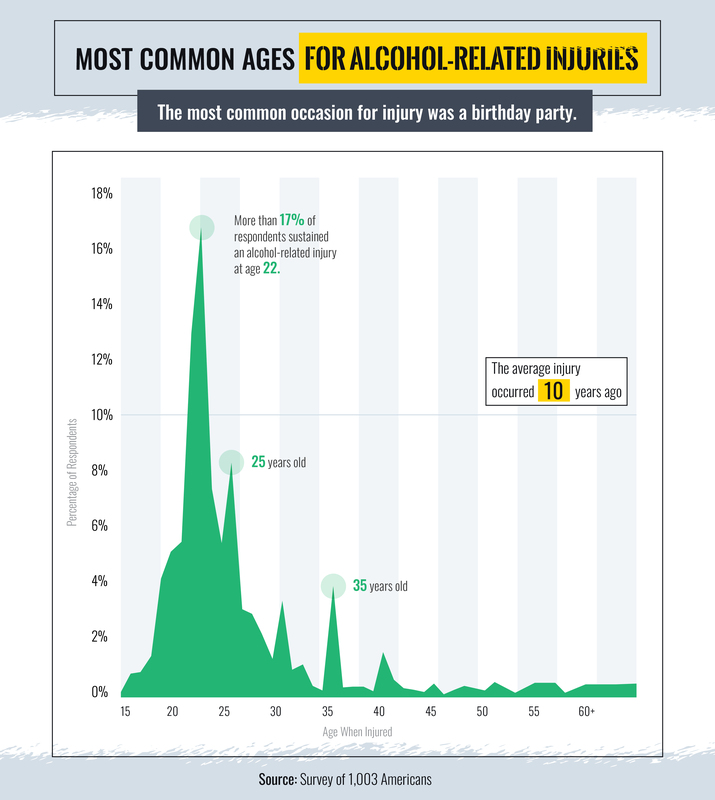 With alcohol consumption generally on the rise among the American population, including an increase in high-risk drinking, it is no surprise that most broken bones are entirely unrelated to a special occasion. The riskiest events, though, were birthday parties. Twenty percent of broken bones occurred while celebrating another year on Earth. The frequency of other events resulting in a broken bone was negligible, with the third slot occupied by New Year’s Eve at just 7 percent. When people have had one too many, their extremities seem to become liabilities. Arms and legs made the top three for most-injured body parts among tipsy folks from both genders, with 31 percent of women having hurt their leg and 25 percent of men having sustained an arm injury. Another 18 percent of women and 19 percent of men hurt their head – a type of injury that can have severe ramifications and must be treated with extreme care – and 23 percent of men injured their face (compared to 16% of women). Luckily, most of these bumps and spills resulted in bruising, cuts, and scratches for both men and women. 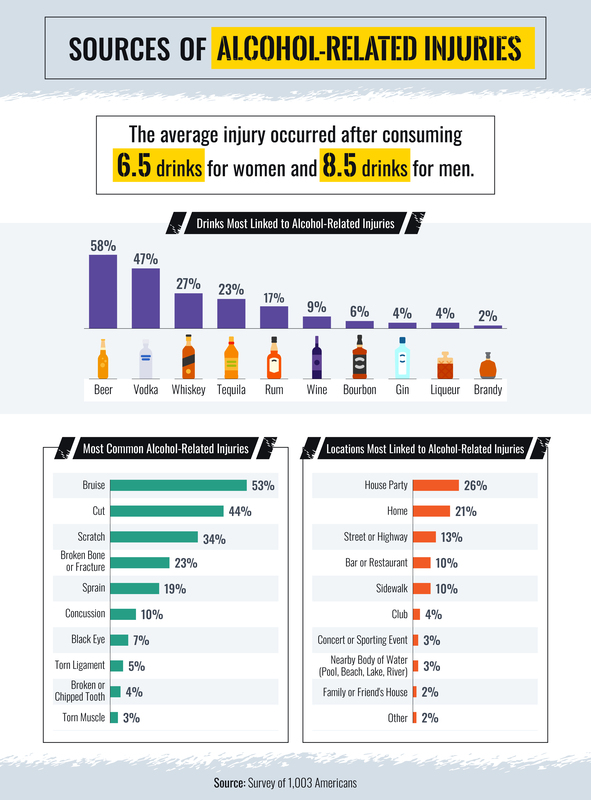 On the whole, the two genders experienced each type of drunken injury at very similar rates. A red Solo cup full of punch can quickly escalate into throwing a punch. There’s just something about alcohol swishing through the veins that makes some people want to engage in fisticuffs. 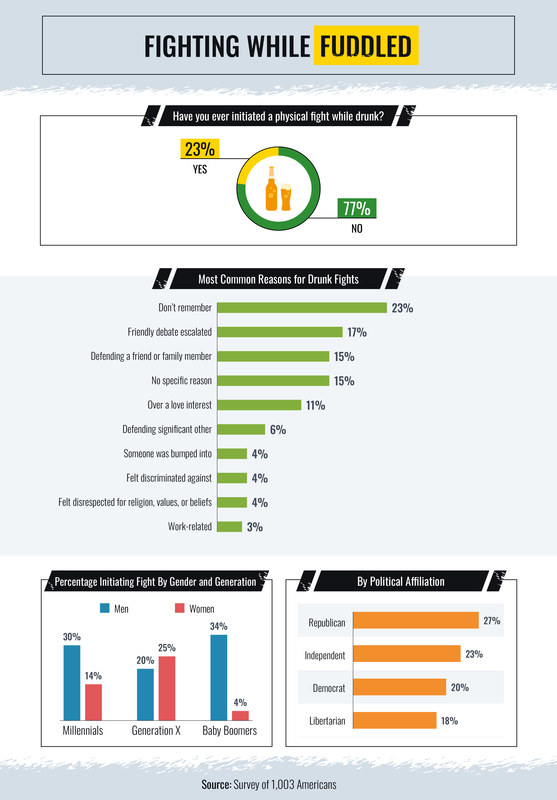 Those people were in the minority, but still, 23 percent of our respondents had initiated a drunken fight at one point or another. One recent study that looked at the effects of alcohol consumption on personality found that while many people tend to blame certain attitude shifts on alcohol, observers noted it had much less of an effect overall than the study subjects self-reported. The role that booze plays in heightening aggression can be mysterious, and according to this study, people have more owning up to do than they might realize. While millennial- and boomer-aged men were the culprits behind the majority of their generation’s boozy brawls, the women of Generation X started more fights than their male counterparts. Slicing the data politically, Republicans were the first ones to swing a punch 27 percent of the time, compared to 23 percent of Independents, 20 percent of Democrats, and 18 percent of Libertarians. Ah, to be young and reckless. According to the Centers for Disease Control and Prevention (CDC), people in the 18–24 and 25–34 age groups are most likely to binge drink, with the average adult consuming seven drinks per binge. 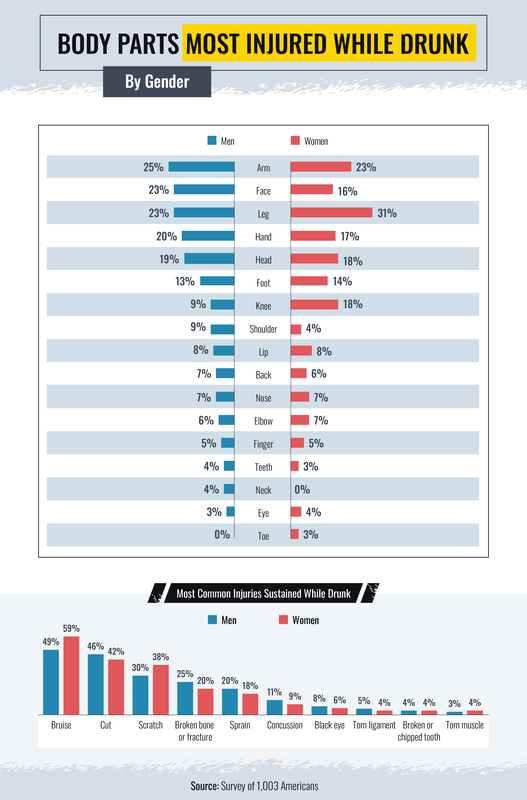 The habit is also twice as common among men compared to women. Alcohol-related injuries began to steadily increase right around the age that binge drinking tends to pick up, peaking aggressively at 22, with more than 17 percent of respondents sustaining a boozed-up injury at that age. After a sharp decline, significant peaks were expressed at the ages of 25 and 35, with a less significant uptick at 30 and 40 years of age. After that, the number of injuries remained negligible. The next time you crack open a beer, remember – you’re staring down the most notorious alcohol for bodily injury! However, vodka and whiskey are far from innocent in their own right, so pick your poison wisely. For the most part, our respondents did not need a special occasion to go a little overboard: Regular everyday drinking binges were at the heart of the grand majority of intoxicated injuries overall. Thankfully, the most common injuries were minor – namely bruises, cuts, and scratches – making for a lesson learned the easy way. And while drunken fights were relatively uncommon, all things considered, most of them transpired for no identifiable reason whatsoever. If you’ve taken a tumble – drunk, sober, or otherwise – Injury Claim Coach is here to break your fall. As the victim of an accident, our service can help you understand your rights and properly negotiate with insurance providers to determine liability and get the compensation you deserve. We surveyed 1,003 Americans on whether they sustained injuries while drinking alcohol. Fifty-five percent of participants identified as men, 45 percent identified as women, and less than 1 percent identified as a gender not listed in our study. Participants ranged in age from 18 to 75 with a mean of 43.5. This campaign’s data depends on self-reporting. There are some complications with self-reported data, such as: selective amnesia, abstraction, attribution, and exaggeration. Statistical testing was not conducted, and as such, the findings above are based on means alone. This study is purely experimental. Research done in the future should explore this topic more thoroughly. Don’t drink and drive, and please don’t utilize our images without giving credit to the authors and providing a link back to this page. Otherwise, feel free to share this study for any noncommercial purposes.